Creating a design of a content widget. Formatting content feeds in the widget. Choosing code format for content widget. How to edit and manage code snippets. First of all, you need to specify content feeds for your content widget. Go to Feeds Box select the feeds you want to provide content for your widget and press "WITH SELECTED" button. Choose "Convert to Content Widget" option from the drop-down. 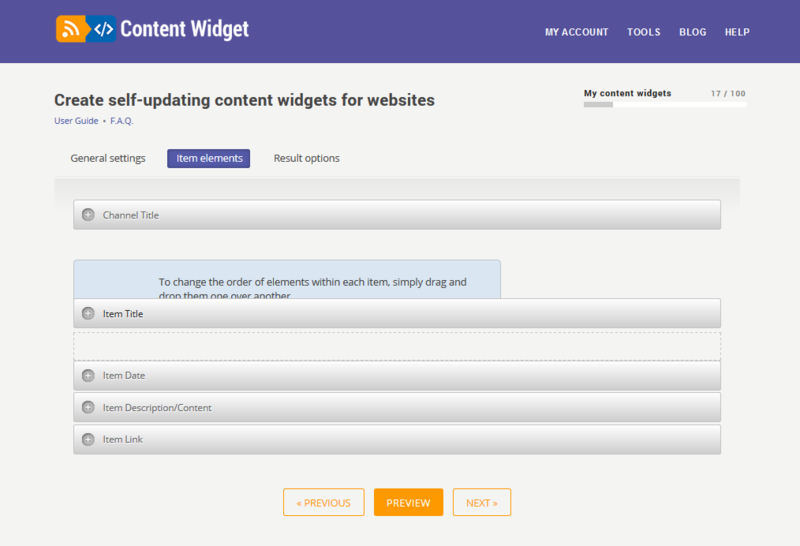 You can also create a new content widget when you generate new feeds. 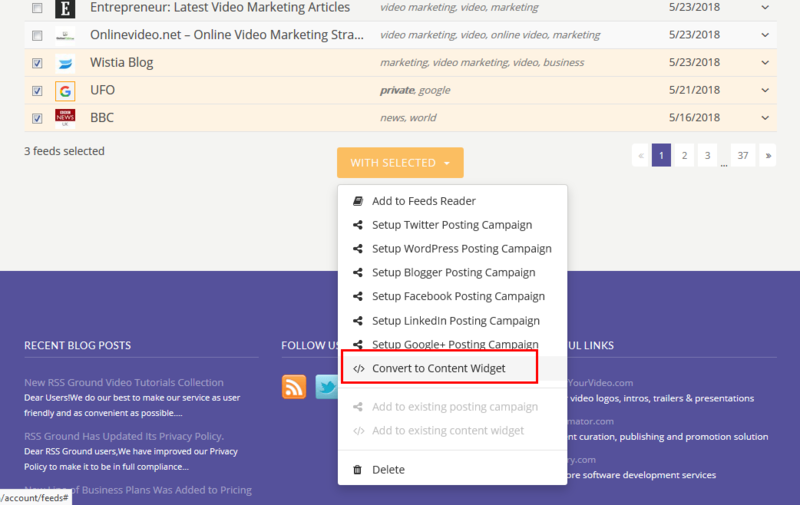 Press GENERATE and choose "Convert to Content Widget". Your feeds will be added to a new content widget and automatically saved in your Feeds Box. 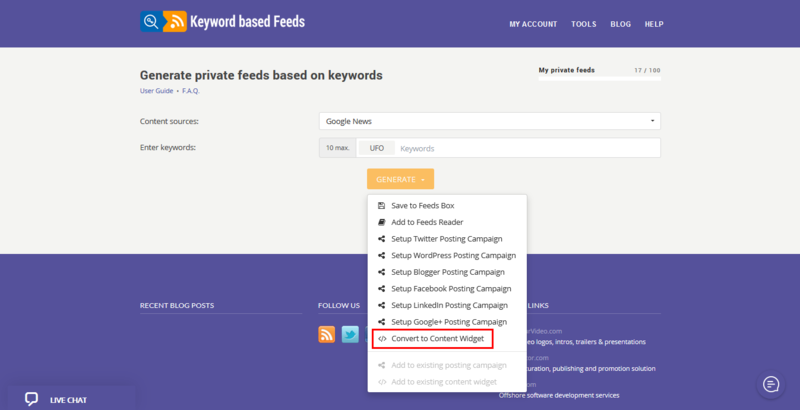 Up to 10 content feeds can be used in one content widget. And you will be able to add, remove or replace these feeds at any point in time. 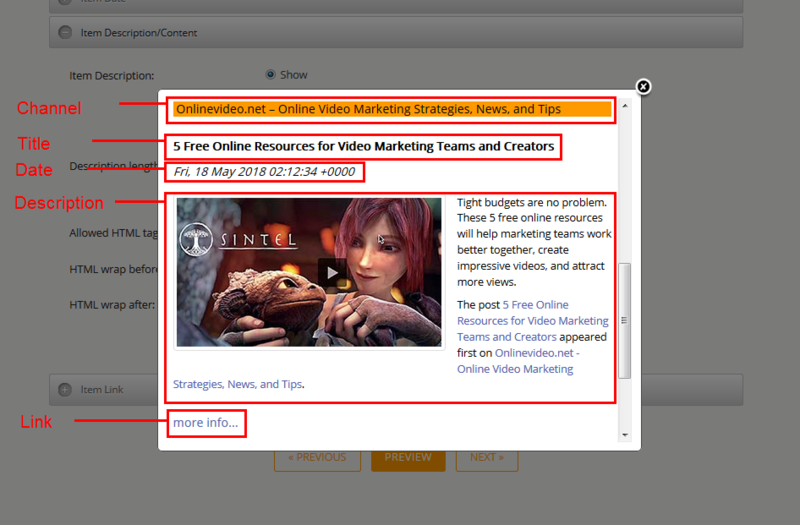 Number of items to show – here you set how many content items (articles, products, images) to display in your content widget. Note: don’t set plenty of items to show. Set a reasonable number in order to make your content block informative but not annoying. By default, only latest feeds items will be shown. But you can set to show older and latest items randomly. Use Shuffle option for that. Those who worry about SEO can safely use "no follow" and "open in new window" options. No follow - will hide links from search engines and won’t let visitors see where links go. Open in new window – this option will open all links in new tab or window. This is a useful feature for keeping your visitors on your page. Start a design of your future content block with its dimensions. Set its width and height in pixels so it would fit allocated spot on your webpage. Or you can leave it empty for a default (100%) value. You can also play with content font by picking up its family, size, color and background color. The best choice is to make it the same as on your website. For a more showy effect, you can add a border to your content block ( Use content block border) and insert separation lines between news and updates (Separate RSS items with lines). To make sure your future content block looks the way you want, please, use PREVIEW. To continue with content block design we need to go from General settings tab to Item elements. Press NEXT button. Before we start here, please you need to understand that each content feed consists of items (news, articles, posts, products), and each item consists of several elements. These elements are channel, title, publication date, description, and link to original source. Learn more about content feed structure. In this section, we will set each of these elements separately. Channel usually includes the topic of content feed and the name of the content provider. You can hide this element using "Don't show" option Channel title will let you hide channel if needed. And if you choose to show it, you can also set its color and background color for its font. Or even specify a background image for your channel. First of all, you can set an order for elements. Which will go first: title, date, link or description. Simply drag and drop element sections. Like with Channel, you can set to show or don't show each element of each item. Also, you can use advanced design editing with HTML before and after options. But some elements have unique settings. For example, item titles by default are linked to the original source. And if you wish to show titles as plain text, make sure Convert titles into links option is not checked. Item's description element has several additional setting options. For example, you can set a minimum and maximum text length. Use Random number of characters option for that. If you set random number as 80-80 each item description will have 80 characters and if it will be 80-100 it will have a random number from 80 to 100. Very often description contains some HTML editing. 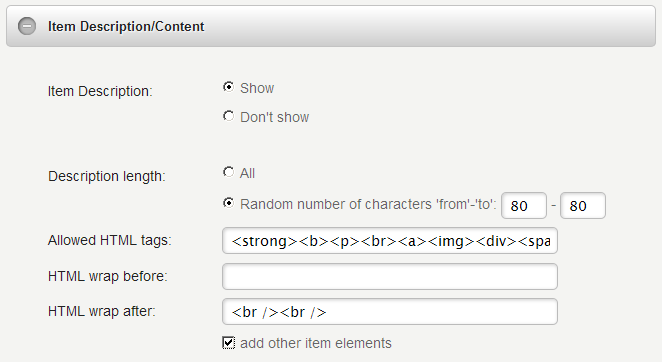 But you can set which HTML tags you wish to remove and which you wish to keep in the description. Use Allowed HTML tags option. Simply specify which HTML tags are allowed. Some of them are already specified by default. Besides main text, the description can contain other specific content elements like author name, media content, additional text, images, and so on. If you wish to include these additional elements into description use " add other item elements" option. You can set "More info" link for your feed items. Just replace default text with your own. Don't forget to use PREVIEW button to see how your content block will look like. We are done with design settings. Press NEXT to go to the final step. In "Result options" tab you need to name your content widget and choose its format. Press GENERATE CODE button. 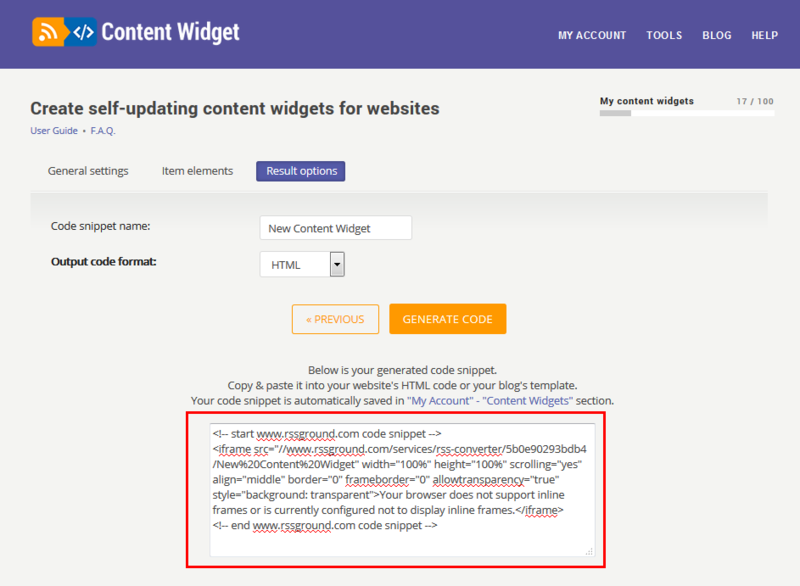 And you will receive a code snippet of your content widget. Now you need to copy and paste it into your website template. 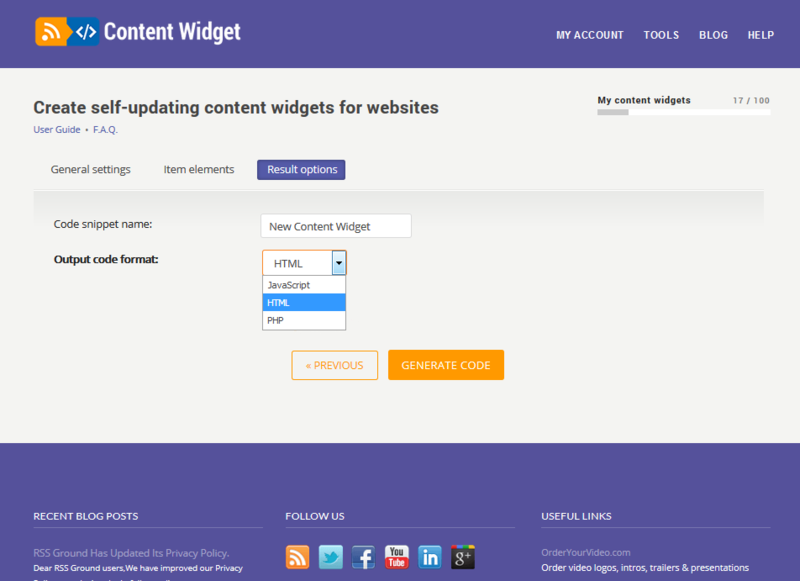 You can find all generated content widgets in MY ACCOUNT - Content Widgets section. 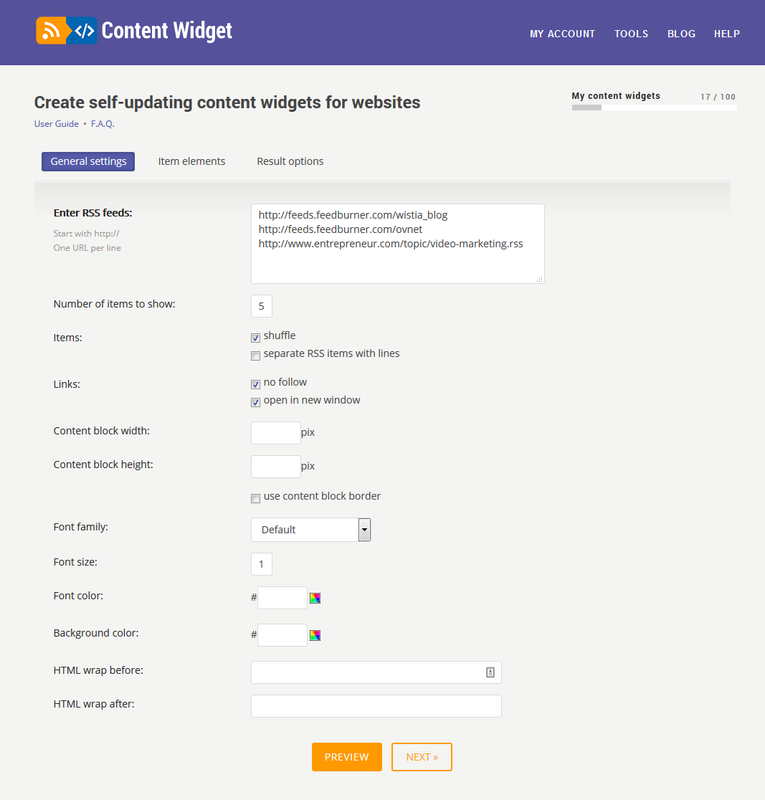 See our separate user guide on how to manage your created content widgets. How to register for eBay affiliate program?